What are the biggest lottery jackpots of all time? You've probably heard about the record-breaking billion dollar Mega Millions and Powerball jackpots in the USA in 2016 and 2018 - here are the other biggest payouts of all time, ranked from biggest to smallest. Note that because the United States taxes lottery winnings this reduces the actual payout of jackpots for lotteries like Powerball and Mega Millions - therefore the actual cash value amount is shown below in brackets. In Canada and most European countries lottery winnings are not taxed. The biggest jackpot for Canadian Lotto 6/49 was CDN$63.4 million in 2013 and the Lotto Max jackpot is capped at CDN$60 million. We accounted for the net jackpot, the sum an individual winner received after tax, or would have received. Lottery winnings are taxable in the U.S., in contrast to Germany and most European countries. For U.S. lotteries we therefore take taxes into account in order to have a fair comparison of actual winnings. Typically, lottery winnings in the U.S. are taxed at an average rate of 25-35%. We used a value of 30%. Note: It is common for U.S. lotteries to pay out lottery jackpots as annuity ("Annuity Option") over several years (e.g. winnings of Mega Millions will be paid out over 30 years). 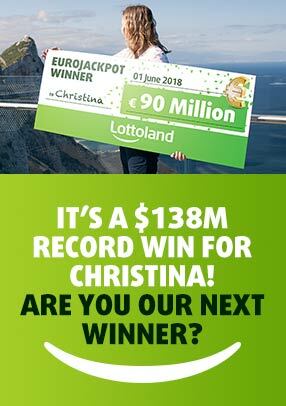 Record jackpots won at Lottoland will be paid out without tax deductions.